Gumbo is synonymous with New Orleans. The delicacy is a tasty mixture of strongly flavored stock, celery, bell peppers, onions, meat or seafood, and a thickener, is usually served over a bed of white rice with buttery french bread or cracker on the side. The delicious dish originated in southern Louisiana in the 1700s and is our state food. 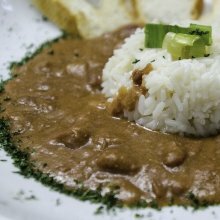 Learn more about the origin of gumbo. 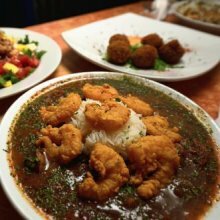 Almost every New Orleans restaurant serves some version of the iconic Louisiana fare. We've put together a list of our faves - some from famous haunts and some that soon will be. 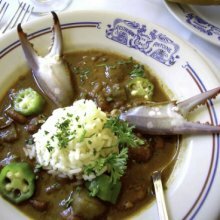 According to Pelican Club Owner/Chef Richard Hughes, great gumbo starts with a deeply flavored stock. 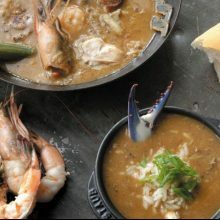 This award-winning French Quarter restaurant combines crab stock (made with a case of crabs) with their own very rich chicken stock. 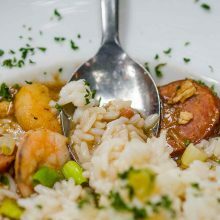 They thicken their gumbo with a nut brown roux and serve with plenty of shrimp, chicken, andouille, and, of course, rice. The shrimp and rice (Chef prefers jasmine rice) are added on top just before serving. Chef says the key is in the seasoning (and in not overcooking the shrimp). It’s a lovely way to begin a meal. It's no surprise this gumbo wins awards. 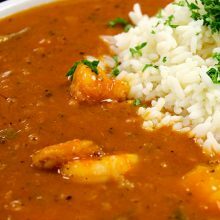 The dish combines okra, onion, bell peppers, celery and a tiny bit of tomato sautéed and blended with shrimp and crabs into a thick brown traditional Creole soup. Is your mouth watering yet? Mulate's Seafood Gumbo is a true seafood-lover's delight. It is roux-based, accented with a variety of fresh delectable seafood. It will leave you licking your bowl and coming back for more. 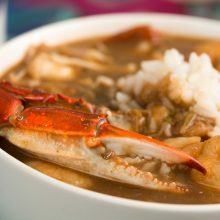 This traditional New Orleans Seafood Gumbo has plenty of crab meat and shrimp. It's so good that it won Best Seafood Gumbo from The United Way's New Orleans Gumbo Cook-Off. If you get a cup, you'll wish you had gotten a bowl because this gumbo is delicious. It's made with a rich dark roux, onion, bell peppers, celery, fresh herbs and of course, local seafood and alligator. One day in the swamps of Lafayette, alligator sausage made it's way into Cajun Nick gumbo roux with some okra and shrimp and this dish was born. This unique pairing is surprisingly tasty. 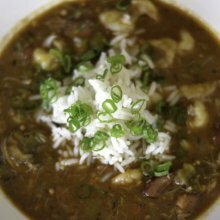 This is a classic preparation of rich Louisiana gumbo with blue crabs, oysters, and gulf shrimp. Believe us when we say it tastes as good as it looks. 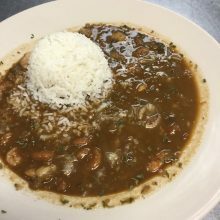 No one can cook up Gumbo like Maw Maw and she shared her recipe with The Courtyard Bar & Grill. A rich brown roux is seasoned with Cajun spices filled with okra, chicken and Cajun pork sausage for a flavorful treat. This entree begins with the Mumbo Gumbo, a file gumbo with chicken. shrimp. crabmeat. crawfish. sausage, okra and tomato. Then, Chef Ron tops it with golden fried shrimp for a very "yumbo" gumbo. 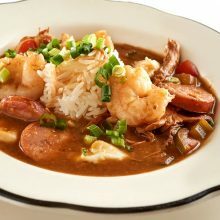 Nothing beats a steaming bowl of gumbo. 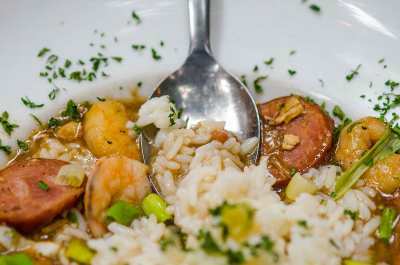 Brennan's delectable dish has crab, shrimp, oysters, andouille sausage and is rounded out with basmati rice. Ooh la la.